Confirms what I have been telling since a long time in regard to soviet AP problems and penetration. Contains a good model on RHA and HHA effects based upon period test data. Throughout the history of the development of the production of ship and tank armor, increasing hardness has been considered as one of the most obvious ways to increase its durability. However, the effectiveness of increased hardness depends on the conditions of fire: on the thickness of armor b , angle of fire α, caliber d and the type of shells, their design and quality. When shelling medium tanks with modern sub-caliber shells, the increase in armor hardness is more effective, the greater the ratio of armor thickness to the diameter of the core of the projectile. To maintain satisfactory survivability of armor, it is preferable to use high holidays instead of low ones. The carbon content in the steel should be as permissible from the point of view of requirements for the weldability and survivability of armor. The task of further research is to establish the most rational composition and structure, as well as the optimal limits of hardness, providing an increased level of anti-slip resistance of rolled armor. Броня высокой твердости dотп — 2,9—3,15 мм)* обеспечила значительное преимущество танков Т-34 перед танками иностранных армий, которое опреде­лялось тем, что немецкие остроголовые снаряды калибра до 75 мм не отличались большой проч­ностью и почти полностью разрушались при вза­имодействии с твердой броней. При появлении на вооружении немецкой армии высокопрочных 75-мм и 88-мм остроголовых снаря­дов с бронебойным наконечником и длинностволь­ных пушек, обеспечивающих начальную скорость снаряда v0 до 1000 м/с, преимущество брони высокой твердости по сравнению с броней средней твер­дости значительно уменьшилось. initially, the high hardness plating used for T-34 armor plates (MZ-2, later (I)8-S grade steel) gave these AFV an advantage because german old model shells up to 75mm incl. (5cm Pzgr Gg & 7.5cm Pzgr rot, my note) were not sufficiently robust to stay intact and broke up on plate. This translated into a serious advantage in resistence (in effect raising the necessary velocity of the broken projectile to beyond muzzle velocity for short barreled 50mm and 75mm guns, in addition to assuring that most of the explosive effect of the projectile was lost on plate, my note). When the germans introduced improved sharp tipped, capped AP for high velocity guns (Pzgr.39 series 5.0cm to 8.8cm, in mid 1942, my note), this advantage of high hardness armor was lost. The soviets conducted systematic trials with 49S & 42S grade, rather soft RHA and 8-S, 52-S & 70-L(cast) high hardness armor against both, domestic and german AP. These tests suggested that HHA still hold an advantage over RHA against Pzgr39 in case the T/D ratio was larger than 1.13 - 1.2 -1.37 (90mm for 75mm pzgr39 or 120mm for 88mm pzgr39, respectively) and in case it was striking at 0° to 50°(88mm pzgr39) or 55° (75mm pzgr39) but was found to be inferior in case it happened to engage under more severe oblique impact (75mm penetrating 100mm HHA and 88mm penetrating 110mm HHA at 60°). HHA was recorded also as distinctly inferior to HHA at all obliquities in case it engaged armor plating of the T/D 1.0 or less (f.e. 5cm pzgr39 engaging 45mm HHA). 100mm high hardness 70-L cast armor had an advantage over RHA in the range 0° to 40° when engaged by 88mm Pzgr39 (T/D=1.13). 100mm high hradness RHA armor was inferior to 105mm Pzgr rot impact at all obliquites. In light of these information, I stand to my claim that the inferiority of HHA was related to the lower energy failure mode caused by adiabatic shear, where a relatively small, calibre sized cylindrical plug was driven out by the impact of an intact penetrator at low obliquity. This failure mode ceases to exist at much above 1.0 T/D ratio. At high obliquity, the inferiority of high hardness armor is a general phenomenon and not related to projectile state (all steel projectiles break up). At high obliquity the armor plate tends to fail by more perpendicular holing events due to the higher resistence of HHA to plastic deformation, which plays an important role during penetration attempt when intending to carve out an S-shaped (curved) penetration channel along the LoS. This explains why the 100 mm IS-3 turret armor and the IS-2 90mm welded /100mm cast glacis -both of which used HHA (at 60°) could be handily penetrated by 88mm Pzgr39 as we know from other soviet trials while the 100mm T54 glacis (at 60°) and the 100mm TIGER2 nose plate (at 55°) which used moderately softer grades of RHA (42-SM in case of the T54) were invulnerable to the same projectile. However, like deep chilled Face hardened Armor, the HHA would be even more god-like in case it would be engaging lower calibre impact (incl. sub-calibre cores), but so would it fare disappointingly in case it would engage high calibre, high quality impact (IS3 pike nose is vulnerable out to considerable distance to 128mm Pzgr39). 4. По живучести броня высокой твердости усту­пала броне средней твердости, причем литая броня высокой твердости имела более высокую живу­честь, чем катаная, что объясняется отсутствием расслоев в металле и большей жесткостью кон­струкции башни. Apparently, in terms of back side spalling, HHA was inferior to RHA, and the rolled armor derivates of HHA for turrets were inferior to cast HHA turrets in this regard due to the absence of laminations in the cast matrix. -this suggests very strongly that RHA was received insufficient temper heat treatment and insufficient mechanical treatment (forging and cross rolling) and was not as strong as it could be made theoretically (my note). This drawing shows the effect of obliquity of 100mm BR412 shot vs 80mm RHA (solid line) / HHA (dotted line). The "capped" performance of the 100mm BR-412 is clearly shown here. Reducing the obliquity from 30° to 0° in case of RHA- and from ca. 45° to 0° in case of HHA does not improve the shells performance due to break up. The effect of projectile break up due to inferior oviet domestic wartime AP-designs is clearly demonstrated. Fascinating. *) While the germans manufactured their own 76.2mm Pzrg39 rot for captured soviet Zi-3 guns, they never issued nor even made test pieces for 85mm Pzgr39 rot projectiles. In the late 1940´s, however, the soviets exploited their spoils of war: German data, as well as their instrument tools for heat treatment of AP-shell steel and capping AP-caps from Sächsische Gußstahlwerke, which were occupied by soviet ground forces after the end of hostilities and had been dismantled 1946 & 1947 to be transported to the soviet union along -likely- with other manufacturers, for making "german" AP shell steel, fuzes and caps for what became the BR-367 85mm post war soviet APCBC-HE ammunition. Last edited by critical mass on 08 Dec 2018 19:58, edited 2 times in total. -the latter (bold marked) allows direct comparison with soviet penetration data (also using this kind of armor, usually referenced at 0°). My guess is that 42-S and 49-S grade is still treated to more than optimal hardness because the 88mm Pzgr39 should defeat 10mm more at 0° and equally 10mm less at 60° when compared with german RHA material. Should state "HHA was recorded also as distinctly inferior to RHA at all obliquities in case it engaged armor plating of the T/D 1.0 or less (f.e. 5cm pzgr39 engaging 45mm HHA). ", right? You are correct. Thanks for pointing it out, I need to edit my post (again). I have compiled the data of the article together with the data provided from the earlier soviet 5cm Pzgr39 trials in order to expose the trends. The graph attached is valid only for 0° impact. As could be expected, RHA attack is broadly within the same range, regardless of attacking projectile. When soviet high hardness, however, is concerned, the trends of soviet domestic shot and Pzgr39 deviate clearly from one another. This linear tilt, where >T/D gives HH some serious advantage over RHA, and likewise <T/D gives a penalty at first made it difficult to understand the phenomenon but it´s really not much different to what is understood as "scaling effect". Scaling appears to be minimum with RHA (for which De Marre developed his eponymous homogenious De Marre nickel steel penetration formula in the late 19th century), with a light tendency to reduce as thickness increases (RHA armor needs to be softened in thick sections to not loose ductility), though take notice that not enough data are presented herewith to differentiate between soviet domestic and Pzgr39 (the latter only has high T/D ratio´s, while the former only has one relatively low T/D datapoint). More research is necessary here. It now becomes clear why the ssoviets after end of ww2 felt the need for reverse engeneered, capped AP. The amount of force required for their domestic designs, quite clearly made it virtually imposible to defeat >1.5 cal HHA, while Pzgr39 were successfully tested up to 2.2 cal vs HHA. Last edited by critical mass on 10 Dec 2018 14:35, edited 1 time in total. Are you trying to say "100mm HHA was inferior to RHA when engaged by 105mm Pzgr Rot at all angles" or "100mm high hardness 70-L cast armor was inferior to RHA when engaged by 105mm PzGr Rot at all angles"? It now becomes clear why the ssoviets after end of ww2 felt the need for reverse engeneered, capped AP. The amount of force required for their domestic designs, quite clearly made it virtually imposible to defeat >1.5 cal/D HHA, while Pzgr39 were successfully tested up to 2.2 cal/D vs HHA. Thanks for the helpful little graph. Both dots for the 5cm Prgr are red. Shouldn't one of those be yellow/green? What does "cal/D" stand for? Did you mean T/cal perhaps? "При обстреле 105-мм снарядами броня высо­кой твердости толщиной 100 мм (b/d = 1,14) при всех углах встречи уступала броне средней твердости." Which equals my interpretation: "100mm high hardness armor was inferior to(in the sense of: when attacked by...) 105mm Pzgr (10cm Pzgr rot, as the old 10cm Pzgr Gg was uncapped and would always break up) impact at all obliquites (as compared to normal hardness armor)", though the T/D given would actually represent a 120mm plate for the 105mm projectile, not a 100mm plate as claimed (I used corrected data in my graph presuming a 100mm plate (T/D=0.95), if the 120mm plate is correct, then the red trend channel would slightly shift to the right, making HHA even less resistent to Pzgr39). Both dots for the 5cm Prgr are red. Shouldn't one of those be yellow/green? They should both stay red. I have no data for 5cm Pzgr39 vs (soviet) 42-S grade "medium" hardness steel from soviet trials. The data I have are against 45mm and 75mm plates of 8-S grade steel, high hardness, rolled, homogenious armor (from T34 armor plate production and late 1942 soviet trials). Because 8-S grade high hardness armor was also used in the article as reference for high hardness armor plating, I found it justified to extend the data to 5cm Pzgr39 from earlier soviet trials using the same target material but different T/D ratios. It´s a reasonable presumption to assume that all data are based upon firing trials but smoothed curves, not original test data. B) the difference to soviet high hardness armor at low obliquity again may be explained by differential hardness. C) the higher resistence of german RHA at high obliquities (>40°) compared to soviet experiences may be related to G(D) definitions requiring 5/5 events, thus allowing a tighter margin of variance than soviet trial definitions. This is significant because break up will occuur at these obliquities, greatly increasing the individual datapoint variances. Partially explainable because german test plate in this thickness band has an increased hardness range (90-105kg/mm² tensile strength) and thus matches closer to soviet medium hardness RHA. D) Considering the differences in test-to test data, one is still stuck with a small deviation in ballistic resistence of german and soviet RHA target materials at high obliquities. The ballistic inferiority of overly hard HHA and medium hardness RHA at very high obliquity is thus, thoroughly confirmed, as could be expected, considering that plugging/discing events will be prominent failure modes in high obliquity realm against broken penetrators. Here, the rather soft (by comparison) german RHA has a distinct advantage over contemporary soviet target materials. This was recognized some time after end of hostilities and S-42 grade armor was subject to a respecification. The new specifications for 42-SM included an additional softening temper heat treatment in it´s larger thicknesses, resulting in a hardness range and a hardness gradient matching german wartime RHA closely. thanks for the helpful graph. I don't want to appear as though I'm trying to nit pick, but I really don't understand this sentence. "It's reasonable to assume that all data is based on firing trials" is what I understood, but not the rest. Here, the rather soft (by comparison) german RHA has a distinct advantage over contemporary soviet target materials. This was recognized some time after end of hostilities and S-42 grade armor was subject to a respecification. The new specifications for 42-SM included an additional softening temper heat treatment in it´s larger thicknesses, resulting in a hardness range and a hardness gradient matching german wartime RHA closely. Very interesting. Is that all in the article you linked or where did you find the the specification for 42-SM? The specifications for 42SM are not dealt with in Alekseev´s et al´s article. This needs to be gathered from other sources such as Pavlov/ Pavlov and others (42-S medium hardness and 43-PS soft hardness RHA were introduced in thicknessess up to 90mm for KV1 and 1943/44 improved by addition of molybdenium to account for cases of temper brittleness, resulting in 42-SM & 43PSM, which, however, were not employed in actual series production until much later. Post war trials showed the need to soften up 42-S / 42-SM and this was eventually applied to T54A/B production in the early 1950´s. Even later, 42-SM was further improved by using explusively heat from electroslag resmelting, and added ca. 6-9% ballistic resistence in T64 in the early 1960´s). However, while they do make mention of comparative firing trials, which showed the need to soften up 42S, I have never before happened to see these data, which are referenced directly in Alekseev´s et al´s article here. However, I pointed also out that the information is for smoothed data curves, not for the test results themselvses. Depending on how smoothing was done, results may differ to today´s practices (today we usually use mathematical splines while back then, they selected the best fitting curve ruler to draw a line through datapoints). Smoothed penetration curves are already an interpretation of test data. Attached is the 75mm pzgr39 penetration graph using the german penetration curves (vs german variable tensile strength RHA material), and the two soviet penetration graphs against medium hardness armor and high hardness armor, respectively. 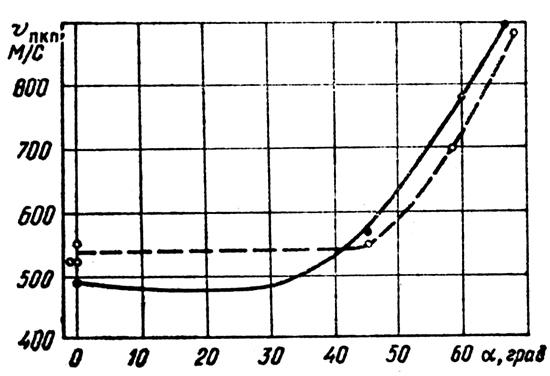 For some strange reason, the soviets give the reference of 1000m/s velocity for the obliquity chart of both 88mm and 75mm, the latter of which is clearly beyond the 75mm KWK42´s muzzle velocity capacity. However, this problem reappears in sources. I cannot decide what is true and therefore have used the 1000m/s german penetration numbers in Lilienthalreport 166 for the Pzgr39. These graphs follow closely the information from the previous 88mm data. The final graph represents my interpretation. If the graphs are to be taken at face value, and referenced to german armor = 1.0 specification quality then it occurs to me that the soviet medium and high hardness armor is ca. 5% to 20% superior -on a thickness base- at 1000m/s against 2.0-2.5 cal thick plating at normal to ca. 30°obliquity. In this zone the penetration is gouverned by intact penetrators in ductile modes of penetration, where the resistence to plastic deformation heavily influences ballistic resistence. The higher hardness levels of 42-S and 8-S steels therefore account for a large amount of this higher ballistic resistence in this realm. At about 30° obliquity, the penetration mode of soviet medium and high hardness armor changes towards plugging caused by adiabatic shear with the plug ejected more to the plate´s perpendicular, thus allowing the projectile to pass with less energy than would be required for, f.e. german target material. This zone extends towards 50° and requires the projectile to stay intact for this effect to occur. The figure of merit of german RHA raises sharply compared to soviet target materials in this obliquity realm and the higher hardness is a disadvantage. At latest at about 50° against medium and high hardness armor, thePzgr39 starts to break up. This causes another change of the failure mechanism back to brittle failure involving broken penetrators with the delta in the figure of merit starting to come down again. I think what this series of posts demonstrates is "tuning". An effect which besets armor procurement strategies in all countries. The armor is optimized by the manufacturerto best meet primarely the official service acceptance conditions. The soviets required their HHA and medium hardness armor to be resistent at 0° when attacked by domestic AP (somehow inferior, for the standarts of the day), conditions under which other forms of armor could not compete with high hardness products. It´s clear from these data that HHA / medium hardness RHA objectively was better under these conditions. The germans required their RHA to resist a very high quality, capped AP at 30° (later 45°) obliquity. These are conditions under which high hardness or medium hardness products were offering grossly inadaequate levels of ballistic resistence compared to what german RHA offered. The primary reason for this is the change from ductile hole forming failures towards a lower energy failure mechanism (adiabatic shear) associated with higher hardness levels present in soviet domestic armor steels. Did the Germans ever test the 122mm БР-471? I'd be interested in the penetration values between 30° and 75° against German RHA. Not as far as I am aware of. But that doesn´t mean they didn´t conduct such tests. However, reportedly, the 80/85mm PANTHER glacis (55°) could not be penetrated by the 122mm БР-471 AP-HE when tested with a target angle of 30°, equalling a netto obliquity of 60.22°. If You presume standart WaPrüf prooving ground practices, this means five out of five successive failures (scoops) at close range and a penetration of <80mm german RHA at 60°, which appears to be significantly less than what the 122mm obtained in soviet trials against HHA (IS-2 welded and cast glacis trials and IS3 pike nose trials, f.e.). Whenever else, the germans needed a penetration figure for comparative penetration purposes, they used the captured soviet service pamphlets but appear to have failed factoring in that the soviets tested against high hardness plate. Eventually, the US have made protection limit graphs for the БР-471Б APBC-HE against post war MIL-S-12560 RHA, which is quite close -at least in hardness- to german wartime RHA. 3.5" (89mm) US RHA provided protection to 122mm BR-471B at 60°and 2634fps, which appears to be in reasonable agreement with german Panther glacis tests, if You allow for some improved obliquity performance of the blunt headed БР-471Б over the sharp nosed БР-471.